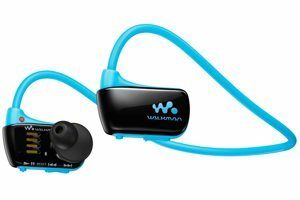 Workout, run and swim3 with the wire-free, one-piece music player you can wear with total freedom. The waterproof design keeps moisture out while you hear true-to-life sound with deep bass. Power up on a 3-minute quick charge for up to 60 minutes of play back1 and enjoy drag and drop ease with iTunes for Mac or Windows. It’s that free and easy. 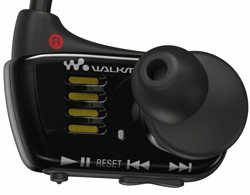 This one-piece music player’s unique design is lightweight, ideal for sports and active lifestyles. 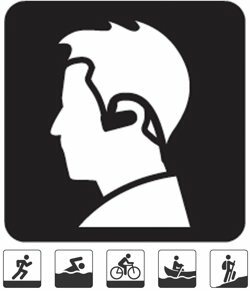 It allows you to be wire-free, hands-free, and without distraction whether you’re working out at the gym, playing outdoors or even swimming3. Use the included USB cable to get up to 60 minutes of use on just 3 minutes of charge1. With an impressive total battery life of up to 8 hours on a full charge1, the NWZ-W273 is ready when you are. With a Walkman player, you are never tied to just one music service. 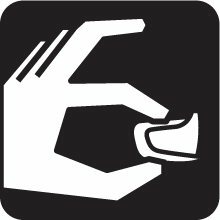 Just drag and drop MP3s from iTunes, Windows Media Player or Internet Explorer and enjoy. 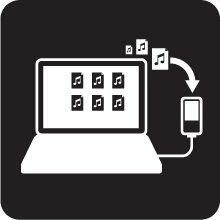 Multi-format playback also lets you play WMA, AAC or L-PCM music files; now that’s freedom. The NWZ-W273S and W274S may be compact in size but can store hours of music thanks to the internal 4 or 8 GB memory2. Searching through your music is simple with the multi-function playback buttons. A quick tap changes songs and a tap and hold changes folders while in all play mode. In playlist mode a quick tap changes songs and a tap and hold changes the playlist. 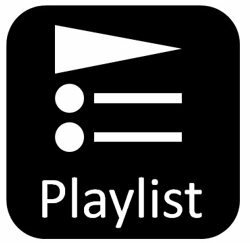 Create your favorite playlists in iTunes or Windows Media Player and drag them to the music player. Use shuffle mode to mix it up. The NWZ-W273S series design is waterproof3 up to 2 meters depth. That means you can swim with it. To ensure a good fit before swimming see enclosed details and at www.sony.com/mp3fit. Do not use in salt water as it has corrosive effects. Exclusive Sony Clear Audio Technologies like Clear Stereo and Clear Bass deliver deeper, richer sound quality. Find the perfect music for the moment using the ZAPPINsearch feature, allowing you to easily navigate through your song collection by playing back main melodies. Everything you need is in the box including USB dock, small, medium, large and large-long ear buds. 1Actual battery life may vary based on product settings, usage patterns and environmental conditions. Battery capacity decreases over time and use. 21 GB equals 1 billion bytes, a portion of which is used for data management functions. 3Waterproof certified to the IPX8 standards, submersible up to 2 meters. Salt water is corrosive, do not use in salt water conditions. 2014 Sony Electronics Inc. All rights reserved. Reproduction in whole or in part without written permission is prohibited. Sony, Walkman, ZAPPIN and their respective logos are trademarks of Sony. iTunes is a trademark of Apple Inc. Windows is a trademark of Microsoft Corporation. All other trademarks are trademarks of their respective owners. Item can be shipped within Brazil. ALL THE WORLD for international shipping.